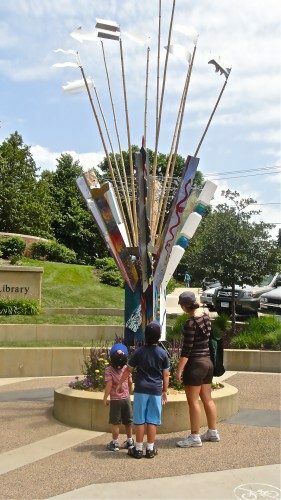 The first creation of the Northfield Young Sculptors Project, “The Tree of Knowledge and Delight,” was unveiled June 29 at the Northfield Public Library plaza near the corner of Third and Division streets. Ten Northfield High School students worked on the sculpture, in collaboration with St. Olaf College Professor Emeritus Mac Gimse and Fifth Year Art Apprentice Jane Meyer. The project was initiated by the Northfield Arts and Culture Commission and received funding from the Southeastern Minnesota Arts Council (SEMAC). The goal is to link artistic, educational and cultural enrichment, by empowering high school students to create public sculpture and to give the town and its residents and visitors a visual treat. The students worked over a period of months to design and execute the piece, taking advantage of opportunities to learn from several local artists. The commission hopes a tradition has been born for professionals and high school students to come together annually to create public art. High school art teacher and commission member Christie Clarke wrote the project grant along with former member Dixon Bond. “Most of the work was done at door 13 of the high school, (a.k.a. the theater work room). Without cooperation from the school it would never have happened and for this we are so grateful!” Clarke said. The students who participated in the project were: Jane Carlson (2013), Helen Forsythe (2014), Maddie Guyott (2014), Seth Hanson (2013), Justin Malecha (2013), Mathilde Mortensen (2012), Dana O’Donnell (2012), Kris Swanson (2014), Avery Swearer (2014) and Zoe Webb (2013). The sculpture will be displayed downtown for a year before being moved to an interior courtyard of the high school.